Paolo Bacigalupi is known as a very serious writer, as his Hugo, Nebula and Prinz Award-winnning books will testify to. 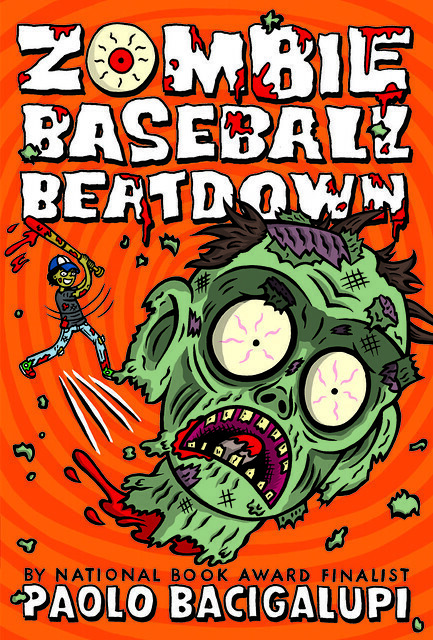 So what’s up with a goofy middle-grade book called Zombie Baseball Beatdown? As Paolo explains, sometimes when everyone else wants you to zig, you just have to zag — and in doing so, recenter yourself as a writer. Sometimes it’s an even stronger reaction: “Sellout” shows up quite a bit. So why would I want to confuse loyal readers by writing a kid’s book with a severed zombie head flying off the cover? To be honest, I didn’t write Zombie Baseball Beatdown just for the giggle (though I fully admit, it was a giggle to write. Hell, I just like saying the title over and over again. It makes me laugh every time). I actually did it because it if I didn’t, I probably wasn’t going to write another one of my “serious” novels ever again. People really do want you to give them something like what they loved before. Unfortunately, when you’re new writer, you’re also expected to do that while everyone is watching. When I started working on my follow-up to Ship Breaker—a novel called The Drowned Cities—I felt a lot of eyes on me. Editors, agents, fans, critics—they were all leaning over my shoulder as I typed. They’d mutter amongst themselves, nodding or shaking their heads, wincing at my character choices, taunting me for my prose clichés…. The resulting novel, written under the oversight of this imaginary committee, was terrible. I ended up throwing it all away and starting over. And then I started over again. And again. And again. While I was fighting my way through The Drowned Cities, my wife, who is a school teacher, was engaged in an uphill battle of her own: trying to win over her most reluctant students to the idea that reading was actually cool. “Zombies,” came the testy reply. She described this encounter to me when she came home from work, and we laughed about it. But for some reason the plaintive desire expressed by that fifth-grade boy really struck me. If my nine-year-old son is enamored with an iPod game like “Earn to Die” where players trick out bigger and bigger vehicles in order to drive over zombies and turn them into bloody road kill, books really do have to step up their game. It seems that we in the writing establishment are so busy making our “serious” literature serious, that we’re leaving our kids bored and restless. And as a result, we’re sending the message that video games are awesome, and books are boring crap. Right then, I decided I wanted to write a zombie book. Now, as much as I like promoting literacy, my sudden obsession with zombie-bashing wasn’t entirely altruistic. The thing that really appealed to me about writing a zombie book for kids was that it would give me a chance to work on a secret project. I just wanted to create, instead of spending all my time looking over my shoulder. For me, Zombie Baseball Beatdown was a chance to play. By writing a story that no one wanted – not my editor, not my agent, not my readers, not my critics– I reclaimed creative space. Once again, it was just me. Just me, writing about three kids on a baseball team who defend their small town from the zombie apocalypse. And instead of having many different voices that I needed to satisfy, I only had one—that boy in my wife’s class who didn’t think reading was fun. Ultimately, it turns out that whether I’m writing novels for adults or for middle school zombie enthusiasts, my themes and agendas still sneak into my stories. It was probably inevitable that my zombie apocalypse would come oozing out of the local meatpacking plant, with its overuse of antibiotics and strange feed supplements and questionable government oversight. And of course, once you’re writing about industrial meat, you can’t help but write about the workers who are often exploited by the meatpacking industry. One thing leads to another, and before you know it, a story about bashing zombies with baseball bats becomes a story about food safety and corporate greed, immigration policy and race in America. Apparently even if I sneak off to write about crazed zombie cows, my stories still end up smeared with all the fingerprints of my “serious” writing. Wherever you go, there you are, as they say. I loved writing this book, and I hope kids will love reading it, too. But more than that, I love what writing this book did for me, creatively. Writing Zombie Baseball Beatdown loosened all my writing knots, and silenced all the critics in my head. Right after I finished the first draft of Zombie Baseball Beatdown, I returned to The Drowned Cities and finished writing that as well. And from there, I went on to write my next novel for adults, The Water Knife. I know this book will feel like a hopeless detour to some people, and I totally get that. I too, have preferences about which stories I wish a certain author would write. But sometimes, the thing that looks like a writer driving into a creative ditch isn’t a ditch at all; it’s actually a short cut—the most direct route to all the other stories that an author is going to write. So if my characters Rabi and Miguel and Joe happen to steal a 4×4 pickup and drive it straight into a zombie horde, well then, you should know that it was also me, driving over a few obstacles of my own. I hope your kids enjoy the ride. Visit the book’s site, which includes an excerpt. Visit the author’s site. Follow him on Twitter.